Our friends sent us loads of farm fresh tomatoes they harvested in their farm. Last week saw the making of a lot of tomato based recipes namely, tomato pickle, tomato rasam, tomato soup and Tamatar Pulao. 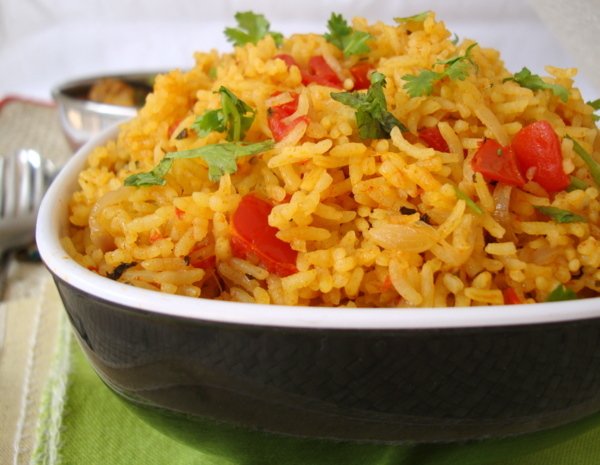 Tomato Pulao is an extremely flavorful rice dish using ripe red tomatoes and rice. 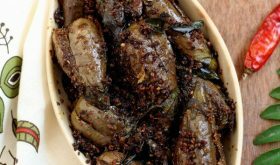 The key to this recipe is in the spices and the use of mint leaves. With raita as an accompaniment, it makes for a great one pot meal. 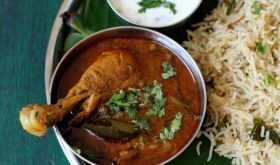 I made coconut chicken curry along with Tamatar pulao which made for a delectable combination. Heat oil+ghee in a vessel or pressure cooker, add shah jeera, cloves, cinnamon and cardamoms and stir fry 30 secs. Add the sliced onions and saute for 3 mts. Add green chili-ginger-garlic paste, mint leaves and kasoori methi and saute for 4-5 mts. Add red chili powder and cumin powder and mix. Add chopped tomato, tomato puree and salt to taste and mix. Cook for 8-9 mts on low to medium flame, or till oil separates. Reduce heat, add the raw rice, mix, saute for a mt. Add 3 3/4 cups of water and bring to a boil. Reduce flame and cook till rice is done. If using pressure cooker, cook rice upto 3 whistles. Remove onto a serving bowl. Garnish with fresh coriander leaves. 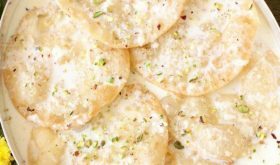 Serve warm with raita or any curry of your choice. You can use 2 tbsps of oil or 1 tbsp oil+1 tbsp ghee. By Sailu Published: December 2, 2011 Our friends sent us loads of farm fresh tomatoes they harvested in their farm. Last week saw the making of a lot of tomato based recipes namely, tomato pickle, tomato rasam, tomato soup and Tamatar Pulao. 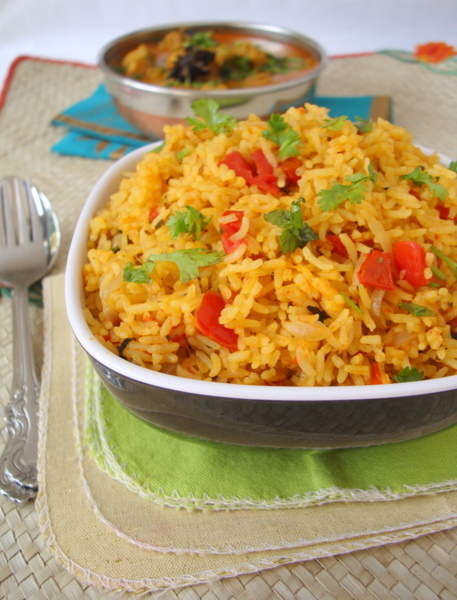 Tomato Pulao is an extremely flavorful rice dish using ripe red tomatoes and rice. Coconut chicken and tamatar rice.. the combo sounds delicious..:) The rice looks super good..
i had tried lot of ur recipes. every item is a hit at my home. i got lot of complements because of you. thankyou so much for the wonderful recipes. i love tomato pulao very much , thanks for the recipe. i will definitely try it. i want to ask you something about a vadiyalu which is used in dal thalimpu. i heard about this somewhere which is used in dal tadka in some parts of Andhra. 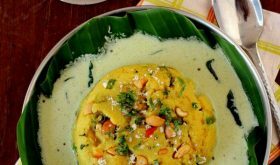 I heard that it is made with udid dal and lasan and it gives dal a very good taste. if you have any idea pl write on you blog. 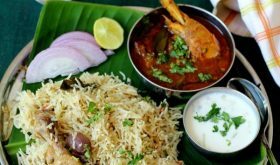 Super flavourful pulao,looks fabulous and inviting..
You got my taste-buds rolling! I just made this and it was fantastic! Everyone in my family loved it. hey sailu, this recipe is too good. i tried it and loved it. i made slight additions- added a small cup of coconut milk once tomatoes were done. also added soya chunks or paneer and peas to make it more healthy. the coconut milk really gave the dish a nice flavor. i just tried ur recipe with trepidation but it turned out fantastic. Thank you! Happy new Year to you. Loved this version of tomato pulav with sliced tomatoes and puree. Should taste amazing giving the fact that I Love Love tomatoes a lot! At the time of adding cloves, cardamom etc. We tried lot of your recipes and I liked them very much and all of them came out very good. Personally I made Tomato pulav and is really awesome.Most of the time my wife tries your recipes but this time I tried by myself. lot of compliments from friends. keep it up. i tried it. It was good. thank you. Very simple recipe , love colors of clicks too !! I love this dish. So tasty and flavoursome. I add some roasted cashew nuts to the finished dish for extra protein and then we eat as a one pot meal, just with some raita and pickle. 250 ml cup will do. For one cup of rice, use 1 3/4 cup water, if using basmati rice. If using any other rice, use 2 cups water. Tried this yesterday. Came out very well. Loved it.